Texas Land Survey Map Series: An indispensable book for any serious professional or researcher interested in the County's history or land (or both), or its first landowners after Texas's Independence from Mexico. Each book in this series is laid out into multiple maps using a 6 mile high by 4 mile wide grid. 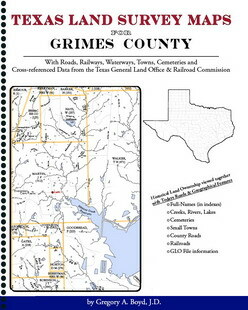 This book contains approximately 48 such Land Survey maps. 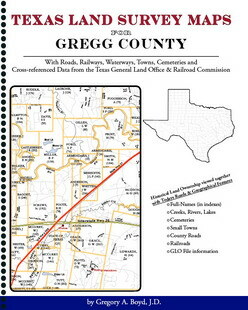 Each Land Survey Map shows the boundaries of original parcels laid out over existing roads, railroads, waterways. These are shown as well as the original Survey-Name (person responsible for the survey) and the Abstract Number assigned by the Texas General Land Office to the instrument that gave ownership to that parcel. Beyond the County Land Survey maps, there are equally useful indexes to give you the real details behind each parcel of land and its original survey-name and ownership. 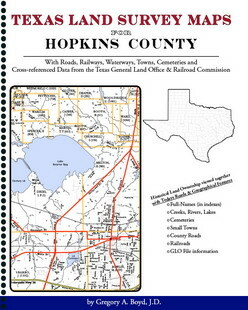 For more Texas books see also Military Records, Alabama, "B" and "K" Sections.